Film and History is a compelling and unique overview of the cinema and its relationship with history, ranging from the ancient world to the modern day. 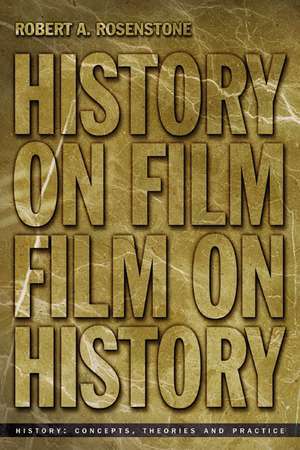 This is the first book of its kind to offer such a broad historical and theoretical portrayal of the rapidly-growing sub field of history and film. Rosenstone introduces the varieties, types and traditions of historical films made worldwide and sets this against the changing ways in which historians and other public critics debate the portrayal of history in modern film. "...it is timely that a prominent American historian has taken a critical look at history on film..."
"...an important book that should be read and discussed." Professor Robert A Rosenstone of the California Institute of Technology is currently the leading scholar in the world in the controversial and growing field of history and film. He was the historical consultant on Warren Beatty's Academy Award winning film Reds. Rosenstone is the Founding Editor of Rethinking History: The Journal of Theory and Practiceand his other publications include Crusade of the Left: The Lincoln Battalion in the Spanish Civil War (1969), Mirror in the Shrine: American Encounters with Meiji Japan(1988), King of Odessa (2003), and The Man Who Swam Into History (2005). He also wrote the award winning Romantic Revolutionary (1975) upon which the film Reds was based. History films have often been criticised by academics and journalists as inaccurate depictions of the past. Yet there is no escaping the fact that blockbuster history films, documentaries and docudramas are increasingly influential in shaping our understanding of historical people and events. The very controversies that erupt over so many historical films are testament to the central role that films play in making history accessible. · the dramatic feature, the Biofilm, the documentary and the Innovative or Opposition drama. · the filmmaker as historian, focusing on Oliver Stone as a brilliant historian of the Vietnam era. Professor Robert A. Rosenstone of the California Institute of Technology is a leading scholar in the controversial and growing field of history and film. His award winning biography of John Reed, Romantic Revolutionary (1975), was used as the basis of Warren Beatty's multiple Academy Award winner, Reds, on which Rosenstone served as historical consultant. He is author of several works of history, including Visions of the Past: The Challenge of Film to Our Idea of History (1995) Crusade of the Left: The Lincoln Battalion in the Spanish Civil War (1969) and Mirror in the Shrine: American Encounters with Japan (1988). He is editor of Revisioning History: Film and the Construction of a New Past (1995) and Experiments in Rethinking History (2004). He is the Founding Editor of Rethinking History: The Journal of Theory and Practice.